You shouldn’t have to avoid your patio at night due to poor lighting. In fact, by choosing certain light temperatures and styles, you can turn a plain patio into an excellent event space. Whether you want a cozy summertime reading nook or an open, year-round outdoor dining room, the right patio lighting will turn your space into something super. Appropriate nighttime lighting is bright enough for you to see clearly but not so bright that it reminds you of daytime. 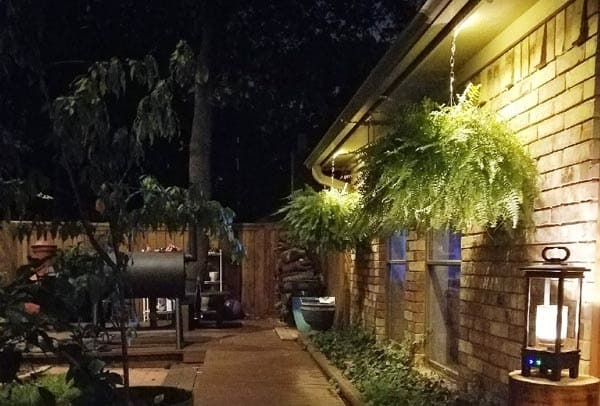 Outdoor lights should not be in areas where they might shine in people’s eyes, but you do want some that sit above the patio to provide the main lighting. Lining patio steps and railings with low-voltage LED fixtures or string lights helps you stay safe as you move around the space. Color temperature is another feature that affects the mood of your patio at night. Temperature, in this case, refers to the Kelvin value of the bulb, and the higher the Kelvin number, the brighter the bulb is. White lights, especially with a blue tint, are called “cool” lights. When placed outside, cooler color temperatures do well in relatively dark surroundings. The contrast between the clean bluish-white light and the dark is clear. If you want a relatively dark patio with just enough light to see, some cool white lights may be enough; however, too many can make the patio seem harshly lit. In contrast, warmer color temperatures, which give you that cozy yellowish glow, are good for when you want to add light fixtures to the entire patio without creating too much contrast with the dark. Add too few warm lights, however, and you may find it difficult to see well enough. Smart controls can be accessed from your phone, allowing you to turn on your outdoor lights before you reach the patio. If you prefer gadget-free lighting, there are other exterior lighting control options as well. All outdoor lighting should be low-voltage and LED bulbs are preferable; controls located outside need to be in weatherproof boxes. Motion detectors are great for security lighting around the house, but they may not be a great option for patio lighting. If you want to use the patio to relax in the evening, you don’t want the lights going out suddenly because you aren’t moving all the time. One issue you should keep in mind is light pollution. It is possible to have beautiful outdoor lighting that lets you see clearly at night without contributing to the problem of urban light leakage. Excess lighting that “leaks” out into the atmosphere to form that familiar urban glow can interfere with the view of stars and other celestial phenomena. San Antonio has both the Curtis Vaughan Jr. Observatory at UTSA and the Scobee Planetarium, and the region surrounding the San Antonio metro area has several spots known for clear skies and star views, so keeping that glow to a minimum is essential. The city of San Antonio has taken steps to reduce urban light pollution, and you can help by installing appropriate exterior light fixtures. When you choose your lights, you want ones that send light out and down, but not up. String lights are generally too small to contribute much to the ambient urban glow, but torches, spotlights, landscape path lighting, and general deck lights should have solid, opaque tops that don’t let light shine upward. If you like the uplighting style, go for smaller lights that sit below a railing or other obstacle; that way, you can have the uplight effect without actually sending extra light up into the environment. You’ll have adequate outdoor lighting that fits the mood you want to set on your patio without the astronomical side effects. There are so many options when it comes to patio lighting, and it can be difficult to decide on exactly what lighting arrangement you want. 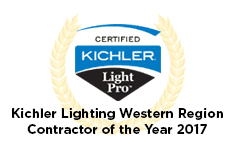 You need a good lighting company to help you sort through your options, create your patio plans, and install your light fixtures professionally. Enhanced Outdoor Lighting & Design is ready to assist you with all your lighting projects.